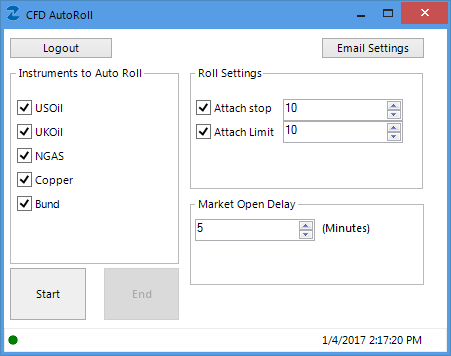 CFD Auto Roll is an app designed specifically for trading CFD instruments that have expiration dates (US Oil, UK Oil, NGAS, Copper, and Bund). When the expiration time is reached, these CFD instruments automatically close. Many traders ask for an option to have those trades automatically re-opened once trading resumed, that’s where the CFD Auto Roll app steps in. When expiration time is reached for one of the instruments above, the app has the ability to automatically send an order to open a new position of the same size once the market re-opens. You can select a stop and limit in pips for the newly opened position, as well as set up email alerts via the app. The app must be running during the rollover transition. If your computer or internet connection is unstable, then using a Virtual Private Server (VPS) to run the app is recommended. Note that since the old CFD position will be closed automatically upon expiration, any unrealized profits or losses of those positions will be realized when those trades close. Likewise the normal trading cost of paying the spread (and any applicable commissions) will be realized when the new position is opened. An FXCM account is required.